The Aberdeen Renewable Energy Group (AREG) has signed a Memorandum of Understanding (MoU) with The Business Network for Offshore Wind (the Network) in the United States. 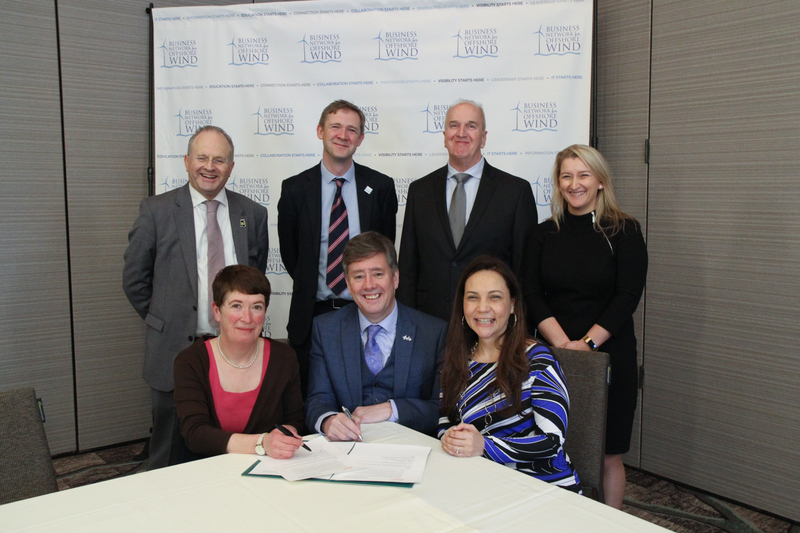 The agreement, which was signed at the International Offshore Wind Partnering Forum (IPF) in Princeton on Wednesday (April 4), will see the organisations collaborate in pursuit of mutual commercial, strategic and policy interests in promoting the offshore wind industry in the U.S. and the UK. Speaking from the Offshore Wind Partnering Forum, the Scottish Government’s Economy Secretary Keith Brown MSP said: “Scotland has huge offshore wind potential and some very exciting and innovative developments already taking place. This MOU will run for three years, at which point a joint review will be undertaken by the directors into its effectiveness in achieving its objectives. Back (L-R) John Best of James Fisher Marine Services; Andrew Thompson of Atkins; Ross Tyler, Strategy and Development Officer of BNOW; and Una Brosnan of Atkins. Front (L-R) Morag McCorkindale of AREG, Keith Brown MSP, Scottish Government’s Economy Secretary and Liz Burdock, Chief Executive of BNOW.